Brain Awareness Week is here again to remind us of the importance of the all too precious brain we carry around. Brain Awareness Week (BAW) is the global campaign to increase public awareness about the progress and benefits of brain research. Every March BAW unites the efforts of organizations worldwide in a week-long celebration of the brain. 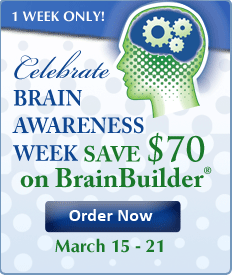 Advanced Brain Technologies is a proud partner of BAW and has a special offer on BrainBuilder® March 14-20. BrainBuilder is a proven program of computer based training to improve working memory, the foundation of learning. Brain Awareness Week was founded and is coordinated by the Dana Alliance for Brain Initiatives and European Dana Alliance for the Brain. There was such a great response to yesterday’s program on the use of BrainBuilder® for working memory training at the 2010 ADHD Awareness Expo we are following it up with a Q&A this afternoon! This is a great opportunity to find out answers to any questions about working memory training and BrainBuilder® as a complementary approach to helping people with ADHD. Questions are now being accepted and I will begin answering them today at 4:00 pm Eastern. Please submit your questions now and listen live at 4:00 Eastern. You also have the option to listen live over the telephone. Please note: Long Distance telephone charges may apply. The first Virtual ADHD Expo launched yesterday and is running through the end of this week. This event is organized by ADHD expert Dr. Rory Stern and ADHD Coach Tara McGillicudy. This discussion will center on issues with diagnosis differentiation, medication, “attention windows”, IQ, and treatment focusing on early research results using Advanced Brain Technologies BrainBuilder® software to help people diagnosed with ADHD. I hope you will be able to join us tomorrow, September 15th for this dynamic conversation! ADHD is greatly misunderstood. People are held back because they are asked to march to a drum that doesn’t beat for them. In recognition of ADHD awareness week here in the US, I’d like you to join us for the first ever Virtual ADHD Awareness Expo. You’ll get access to the experts from the comfort of your own home, all week long, when it is convenient for you. Register today for free and get access to presentations, demonstrations, and the latest information from leading experts, authors, and companies serving the ADHD community. Brain Awareness Week is here! Well, it has been here since Monday, but I have been so busy I have not had a chance to share a quick post to let you all know we are running an amazing offer on our BrainBuilder® brain fitness program at www.advancedbrain.com. I want everyone to have the opportunity to achieve their maximum potential and certainly hope that $70 off on BrainBuilder will get you on your way! Advanced Brain Technologies featured in The State of the Brain Fitness Software Market 2009 Report published today. This annual report profiles the top 20 companies in the brain fitness software market. Despite being one of the first movers in the brain fitness market with the introduction of the original BrainBuilder® software program in 1999 Advanced Brain Technologies is grouped in the “Wait and See” category in terms of market position. This is due to our focus not being exclusively brain fitness software. As a market leader in music-based intervention we are diversified beyond software unlike the other leading companies in the report which offer strictly software based solutions for assessment and improvement of cognitive functions. With new research and developments in market sectors including; consumer, healthcare, K-12, corporate, and military, our market position will be shifting significantly in the next 12 to 24 months. 1) Growth market: Consumers, seniors’ communities and insurance providers drove year on year sustained growth, from $225m in 2007 to $265m in 2008. Revenues may reach between $1 billion to $5 billion by 2015, depending on how important problems (Public Awareness, Navigating Claims, Research, Health Culture, Lack of Assessment) are addressed. 3) Investment in R&D seeds future growth: Landmark investments by insurance providers and government-funded research institutes testing new brain fitness applications planted new seeds for future growth. 4) Becoming standard in residential facilities: Over 700 residential facilities – mostly Independent and Assisted Living facilities and CCRCs – have installed computerized cognitive training programs. 6) Assessments: Increasing adoption of computer-based cognitive assessments to baseline and track cognitive functions over time in military, sports, and clinical contexts. The Alzheimer’s Foundation of America now advocates for widespread cognitive screenings after 65-75. 8) Aggressive marketing claims are creating confusion and skepticism, resulting in a distracting controversy between two misleading extremes: (a) “buying product XYZ can rejuvenate your brain Y years” or (b) “those products don’t work; just do one more crossword puzzle.” The upcoming book The SharpBrains Guide to Brain Fitness aims to help consumers navigate these claims. 9) Developers can be classified into four groups, based on our Market and Research Momentum analysis: we find 4 Leaders, 8 High Potentials, 3 Crosswords 2.0, and 6 Wait & See companies. 10) Increased differentiation: Leading companies are better defining their value proposition and distribution channels to reach specific segments such as retirement communities, schools, or healthcare providers. Order a copy of the report at www.sharpbrains.com. March 16-22 is Brain Awareness Week. Brain Awareness Week (BAW) is an international campaign dedicated to advancing public awareness about the progress and benefits of brain research. Founded and coordinated by the Dana Alliance for Brain Initiatives and its sister organization, the European Dana Alliance for the Brain, BAW is now entering its fourteenth year as a catalyst for public understanding of brain science. The Dana Alliances are joined in the campaign by partners from around the world, including universities, hospitals, patient groups, government agencies, schools, service organizations, and professional associations. Advanced Brain Technologies is a proud campaign partner and is offering a $50 discount on BrainBuilder® to encourage brain fitness for everyone! For information on this limited time offer please visit http://www.abtmedia.com. The very clever and always entertaining Tori Deaux of MindTweaks.com fame has just written her review of our brain fitness program BrainBuilder®.